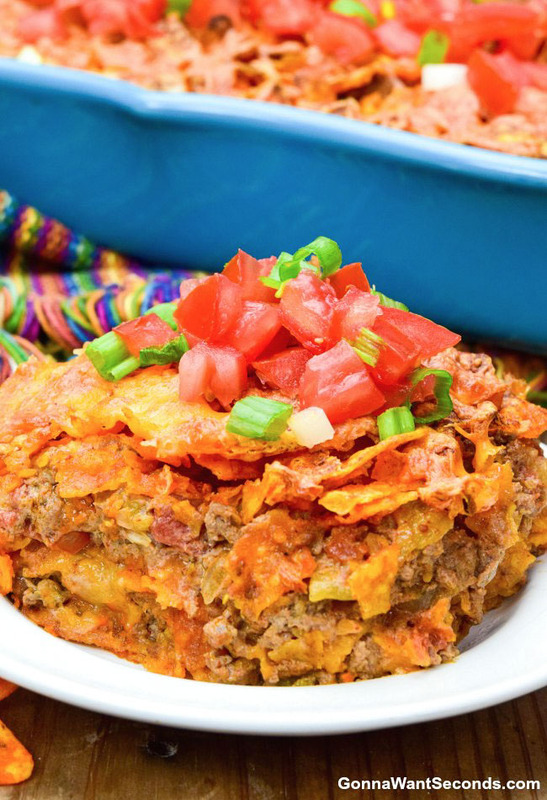 Dive into a delicious, Dorito-studded casserole layered with a zesty beef filling – it has all the flavor of our favorite orange chips without all the hassle of orange finger-tips! Did you know Doritos descended onto supermarket shelves the same year Captain Kirk was “beamed up” to the Enterprise? (That was 1966, by the way, when Southern Living also hit the printer.) I always thought that Starfleet logo looked a lot like one of my favorite, cheese-crusted snack foods! Tortilla chips are great, but there’s nothing quite like Doritos, those thin crispy chips dusted with cheese, spicy peppers, or ranch dressing (and some strange flavors like tuna mayo in Japan). Even the risk of orange-stained fingertips and white shirts doesn’t dissuade partygoers from consuming giant bags of these tasty triangles on game day (like $5B worth each year) or moms from downing a lunchbox snack bag before the kiddos get home. Doritos are so popular they’ve even shown up on the menus at fast-food chains like Taco Bell and in multi-million dollar Super Bowl ads. Over the last several decades, the always dependable and infinitely creative home chefs have developed many recipes to incorporate these “little golden things” (from their original name of Doridatos) into everything from burgers and “bombs” to breading and “bakes,” and this Easy Dorito Casserole recipe showcases them in an epic fashion. 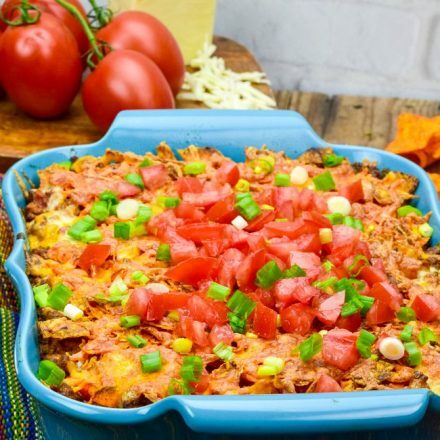 Imagine a layered Dorito casserole, savory pieces of beef swimming in a creamy, cheesy Mexican-inspired concoction with chunks of tomatoes and Frito-Lay flavor fests in every mouthful. Hungry yet? And did I mention you can have it on the table in about 30 minutes? 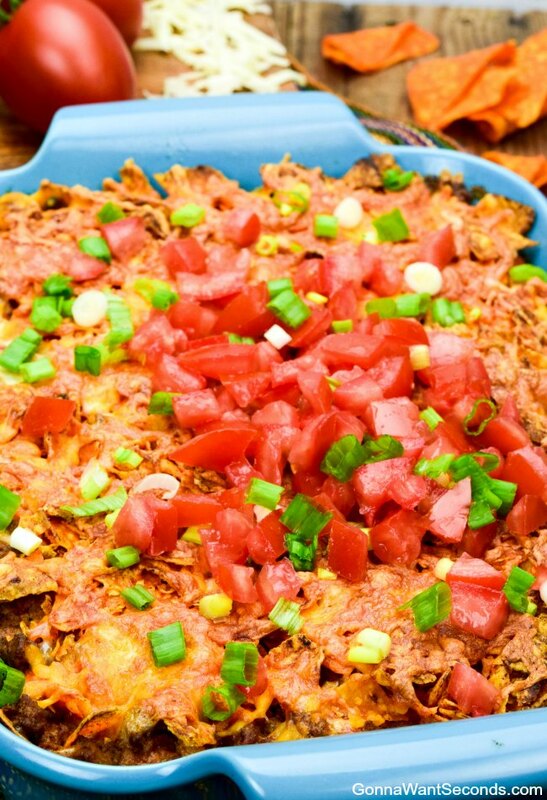 HOW TO MAKE DORITO CASSEROLE? To make this delicious Dorito Casserole simply brown the beef and onion, add the taco seasoning, tomatoes, chilies, mushroom soup, and sour cream. 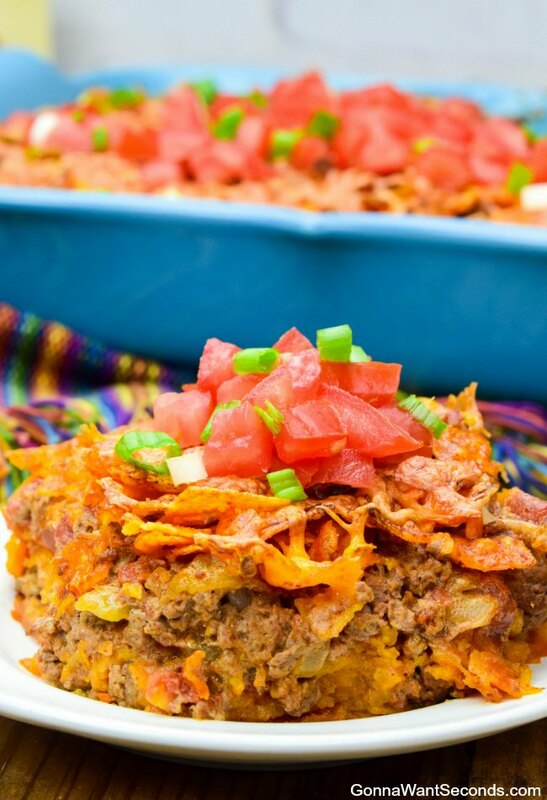 In a 9X13 inch baking dish alternate 3 layers of crushed Nacho Dorito Chips and 3 layers of the beef mixture. Sprinkle top with cheese and bake until bubbly. This is so easy to put together and such a tasty casserole that I often use it for potlucks and meal trains. 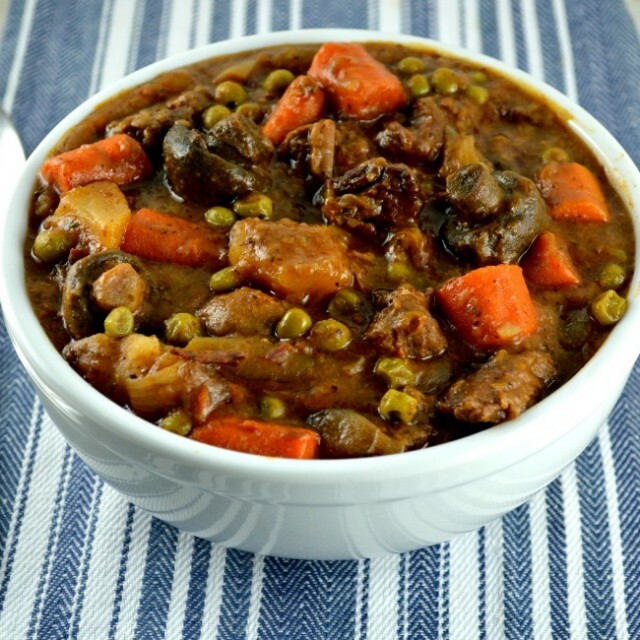 This Casserole brings Everyone to the dinner table is a hurry with smiling faces! Quick and Easy to Make- Only takes about 30 Minutes. 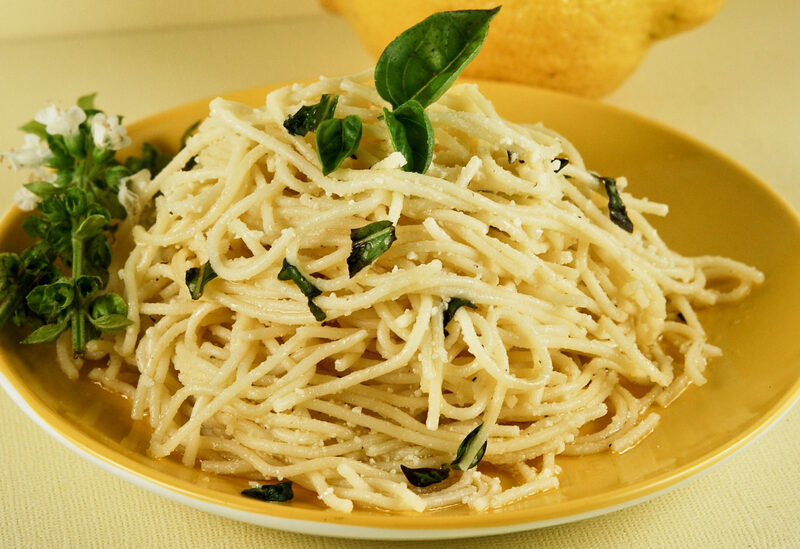 The recipe makes a generous amount so there’s plenty for everyone! 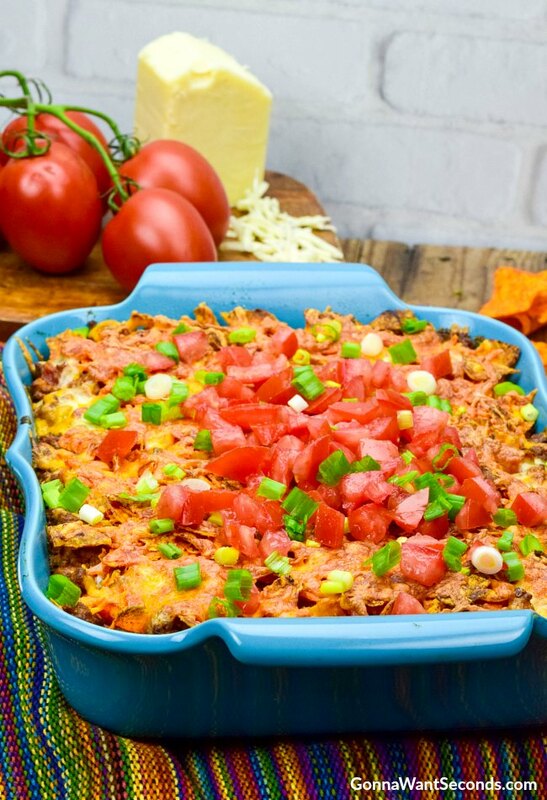 Dive into a delicious, Dorito-studded casserole layered with a zesty beef filling– This Dorito Casserole has all the flavor of our favorite orange chips. In a large skillet, over medium heat, cook the beef and onion until no longer pink. Remove excess fat. Stir in taco seasoning, diced tomatoes, diced chilies, sour cream and cream of mushroom soup and heat through. Place one-third of the crushed Doritos in the bottom of the baking dish then add half of the beef mixture. Top with one-third of the crushed Doritos, then the remaining beef mixture. Add the last third of the remaining Dorito's and Sprinkle top evenly with cheese. Bake, uncovered in preheated oven until heated through and cheese is bubbly about 2o minutes. What Is Dorito Casserole Made Of? Beef: My version’s made with beef – ground chuck or another cut of meat with an 80/20 lean-to-fat ratio. You’ll have some excess oil to remove after browning it with the onions, but the beef will be flavorful enough to hold its own in the rest of the casserole. Now for the south-of-the-border inspirations that make this a Dorito taco casserole or Dorito Mexican casserole: taco seasoning, canned tomatoes, and green chilies. Taco Seasoning Packet: This is such a great time saver since they’re full of onions, chili powder, cumin, and other spices you’d have to measure (maybe even buy) separately. I always keep extra on hand at my house too because it makes a great “sprinkle” for popcorn, nuts, and fries, or an easy mix-in to some mayo and sour cream for a quick taco salad dressing. Many home cooks even make their own mix, to control the salt and adjust the flavor to their own liking, and you’ll need about 4 tablespoons of homemade to substitute here. Tomatoes: I like plain, petite diced tomatoes in this recipe so there are lots of tiny pieces throughout the filling. Some recipes make this Dorito casserole with Rotel tomatoes, but they’re seasoned with “secret spices” in addition to green chilies and I’d rather control the flavors myself with the not-so-secret ingredients in taco seasoning. I also like that my casserole ends up a little more tomato-y, since the actual quantity of tomatoes will be more than in a single can of Rotel. Sour Cream and Soup: Next is the “creamy” components: sour cream, which adds a little tang and extra body to the dish, and cream of mushroom soup. The soup thickens and adds a luscious quality to the filling in this Doritos casserole, which is precisely why so many of our favorite casseroles utilize this magical canned good. I love the texture of the little bits of mushroom, plus the subtle earthy flavor. 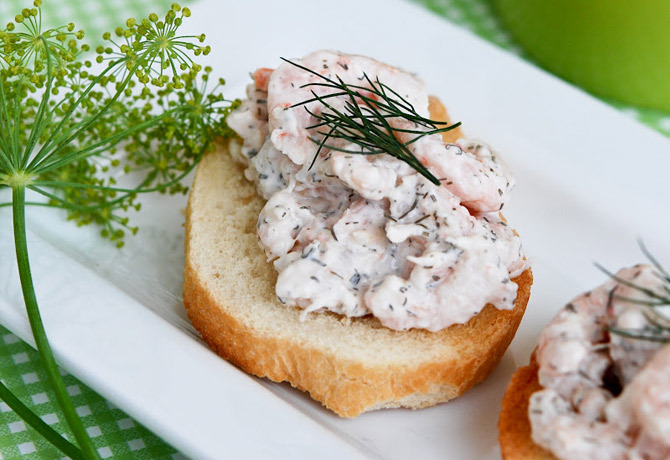 If you have some aversion, you could substitute cream of celery or cream of chicken. Doritos: I use the Nacho Cheese variety, but feel free to experiment with your favorite. I like to keep them in relatively large chunks too so you’ll have substantial seasoned tortilla pieces. They will soften in the oven, just like they do in migas or chilaquiles, and you’ll find some in every bite thanks to the layering technique. Cheese: A generous mound of shredded cheese on top makes this Dorito bake a proper casserole, and I like to use a combination of Monterey jack cheese, which melts really smoothly, and a medium to sharp cheddar. You can also substitute a Colby/jack combo or Mexican blend. 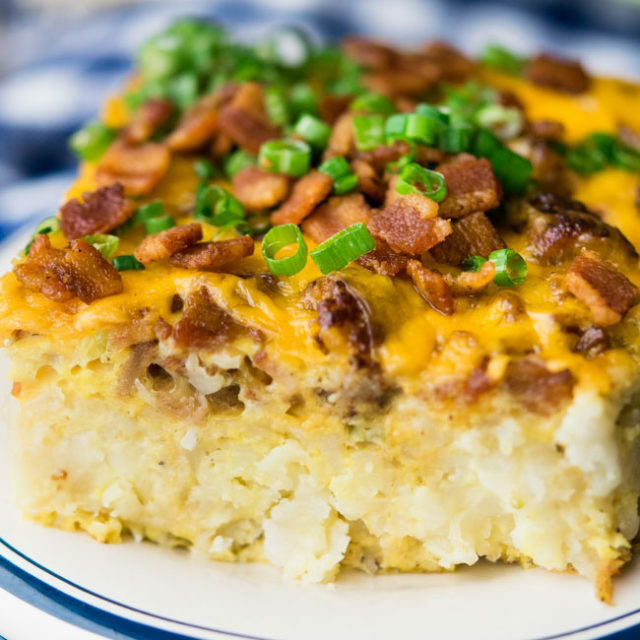 Just try to avoid the ones that have added taco seasoning so this perfect casserole doesn’t get too salty. Some recipes make this Dorito casserole with crescent rolls, lining the bottom of the dish with the dough for a makeshift crust, then layering the Doritos with the filling. This makes the casserole a little too bready for me and competes with the hearty filling. Other recipes top the casserole with a layer of Doritos, but my experience is they still absorb some of the moisture from the casserole and can get a weird chewy/tough texture. I DO like a little extra crunch on this casserole, though, so I serve it with a little bowl of crushed Doritos for sprinkling on top once I’ve spooned it onto plates. Doritos – This is a great way to use up a partial bag of Doritos, like the ones that have been carefully picked over to extract all the fully intact triangles. Don’t throw away that slightly stale bag of chips either because they’ll work just fine in this recipe. To crush them, open the bag (so the air trapped inside doesn’t create a Doritos explosion in your kitchen), then just squeeze the bag to crush them by hand. You can also run over the bag once or twice with a rolling pin or wine bottle. Beans, beans – You can make this Dorito casserole with ground beef and beans which really turns this into a one-dish meal. I like to use two cans of Ranch Style Beans, pre-seasoned with chili-style ingredients that complement the dish. 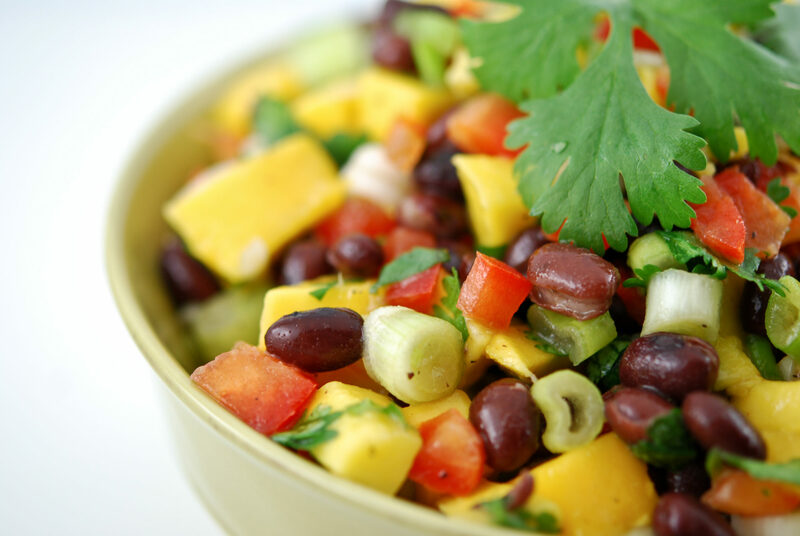 Black beans drained and rinsed, work great in this recipe too. Chicken – If you don’t want to make a Dorito casserole beef version, you can easily turn this into a chicken Dorito casserole recipe by substituting 3 c. of cooked chicken (a great chance to use leftover or store-bought Rotisserie chicken). You can use the mushroom soup or replace it with cream of chicken. Some Like it Hot – If you’re cooking for folks who like things spicy, you can use spicy green chilies (rather than mild), spicy taco seasoning, and spicy Doritos (yes, they even have a habanero flavor). 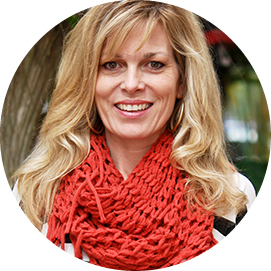 You might just consider serving a little sour cream on the side for this one! Parmesan Crusted Chicken~ This is one of the EASIEST and most delicious chicken recipes EVER! Moist, tender cheesy baked chicken every time. Porcupine Meatballs ~ These super easy meatballs are made with beef and rice then simmered in a delicious tomato sauce. Always a family favorite! 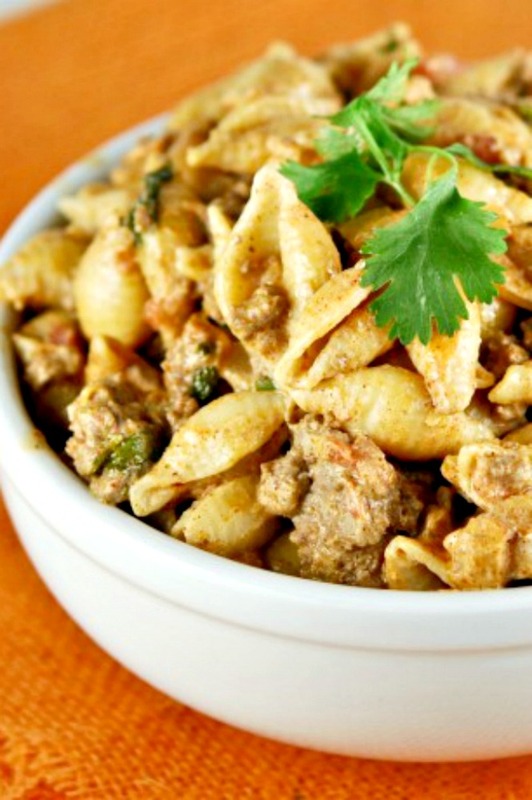 Beefaroni ~ Easy Homemade Beefaroni is perfect for the simplified flavor palates of kids. So much better than anything from a can! Quick and Easy–Ready in less than 30 minutes! Dorito Taco Salad– Our Dorito Taco Salad is made with Nacho Doritos, Zesty Taco Meat, Lotsa Cheese and MORE. Double it for your next Potluck or serve it for Taco Tuesday! I love it when I come across a recipe that we both greatly enjoy. I served it with homemade instant pot refried beans as a side. Oh! My! So good! Fantastic on a polar vortex night. Thank you for sharing. Awesome recipe! Quick meal that makes plenty for leftovers the next day. The Doritos do get a little softer, but not to the point where they’re soggy or icky. I only use 1 package of taco seasoning as I find that’s more than enough and cream of chicken as it’s just my preference. Is this still good as leftovers or does it turn into a soggy mess? I’m thinking it would be good to take for lunch, but think it may turn into mush by the next day. This was sooooooo good, family wants it more often now! Used 1/2 Mexican mix cheese and 1/2 Pepper Jack, also used my own taco seasonings (didn’t have the packets). I will definitely make this a lot!